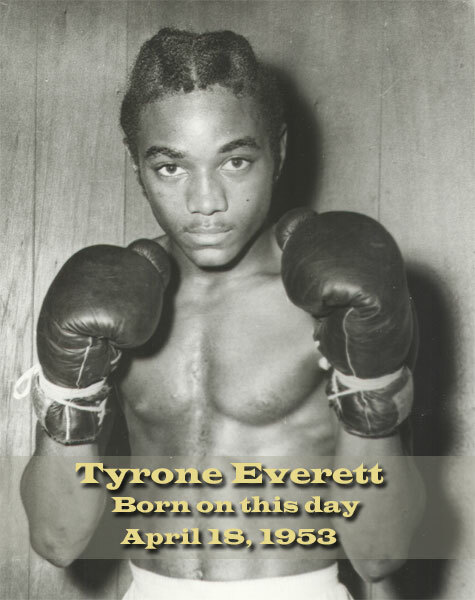 South Philly phenom Tyrone Everett was born on this day in 1953. His mother Doris named her first son after movie icon Tyrone Power. Our Tyrone was actually born in North Philly but relocated with his family when he was a boy. Doris brought her children back to her native South Philadelphia because she felt it was a safer environment than the uptown section of the city where they had been living. Tyrone showed an interest and a talent in art as a youth, but it was with boxing that he would make his way in the world. Naturally gifted in the sport, Tyrone showed his promise early on, turning pro at age 18. Within three years he won the USBA title by beating Sammy Goss. Later he added the NABF championship. In 1976, he dropped a highly controversial decision to Alfredo Escalera in his only world title bout. Everett was killed by gunshot in 1977 at age 24.